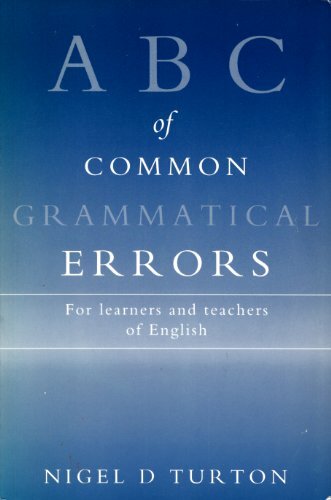 ABC of Common Grammatical Errors . Best GRAMMAR Materials and Practice Book for Reading, Writing, and Speaking. Get GRAMMAR Materials , Tips, Tricks. Practice more and boost your score. *Provides teachers and learners with information needed to examine and correct grammatical errors. *Errors gathered from a large corpus of written texts produced by learners at intermediate and advanced levels of proficiency. *The models of correct usage follow British English, with American English useage described in the relevant entries. *Provides teachers and learners with information needed to examine and correct grammatical errors. *The models of correct usage follow British English, with American English useage described in the relevant entries.